Wolves are pack animals. A pack may have up to twenty members, though six to eight is the average. All packs have a very strict hierarchy of ranks and roles. At the top of the pack are the ‘alpha male’ and ‘alpha female’. This top pair resolves disputes inside the pack and decides the distribution of food. Usually, the alpha female produces the pack’s only litter of cubs (4 to 6 of them), because there isn’t enough food to support litters from all the females. Every wolf in the pack contributes to the upbringing of the cubs. Second in command after the alpha pair are the ‘beta male’ and the ‘beta female’, who play an especially large part in bringing up the cubs. The beta wolves are also the ones most likely to challenge and fight the alphas for top position. Fighting is mostly by bluff and show of aggression—personality counts for more than simple physical strength. The loser in a challenge is often driven away from the pack. At the bottom of the hierarchy is the ‘omega wolf’, dominated and pushed around by all the others. The only consolation for the omega wolf is that s/he is typically the jester of the pack, the one who starts up play and chasing games. 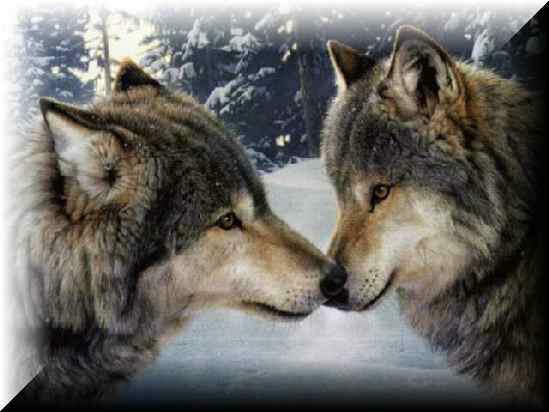 Dominant wolves often rub their bodies against subordinate wolves to ‘mark’ them with their scent. Like dogs, wolves use urine to mark out their territory, where no outsider wolf is permitted to pass. Wolves communicate with body language. Unlike dogs, they rarely bark, and only softly. 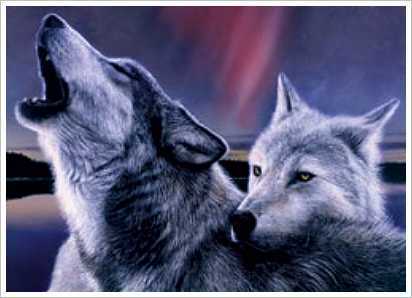 They howl in chorus, particularly at twilight, and particularly before setting out to hunt or after returning. Wolves are the ancestors of all our domestic dogs. They are bigger than all but the very biggest breeds of dog, and have 20% larger brains. They can trot for many miles, or reach up to 65 kph in a short burst. At speed, they can spring 5 metres in a single bound. In colour, they shade from grey to grey-brown to white. White wolves generally live in lands of permanent snow. Their outer coat is made of tough hairs that guard a softer, thicker undercoat. This undercoat is water-resistant and insulates against the cold. A partial webbing between the toes of their paws helps them travel easily over snow. When they attack as a pack, they harry their victim from all sides. They can bring down large animals, like deer and moose, but their success rate is only about one in five. A healthy, fully-grown deer or moose can usually keep them at bay. They don’t get to eat every day, but when they do, they can consume up to 10 kilograms of meat at a time. 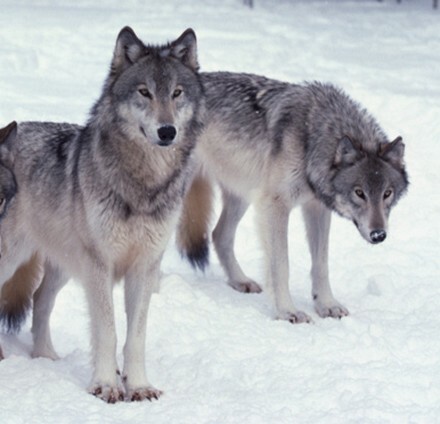 Wolves have always had a bad rap – perhaps especially from shepherds, trying to guard their flocks of sheep and lambs. They caused much fear in medieval Europe, and menacing wolves feature in several folk tales (such as ‘Red Riding Hood’) and myths (for example, the giant wolf in Norse mythology, Fenrir, who will one day bring about the end of the world). On the other hand, there’s a friendly, helpful, magical wolf in a famous Russian folktale, ‘The Firebird’. In fact, wolves almost never attack adult humans, though they will carry off unprotected infants and small children. On the Eastern Front in World War I, great numbers of starving wolves attacked both sides, and the German and Russian armies had to make a truce in order to fight them off. But that’s an exceptional case, and the wolves must have been desperate with hunger to behave so out-of-character. In the “Wolf Kingdom” books, the wolf-soldiers are the baddies – but don’t judge them too soon. How did they get to be that way? Wait for major revelations in Book 4!! !